In honor of the “Pizza Theme” week I’ve shown on my blog, here’s one more “pizza” recipe…but with a twist… Fruit! 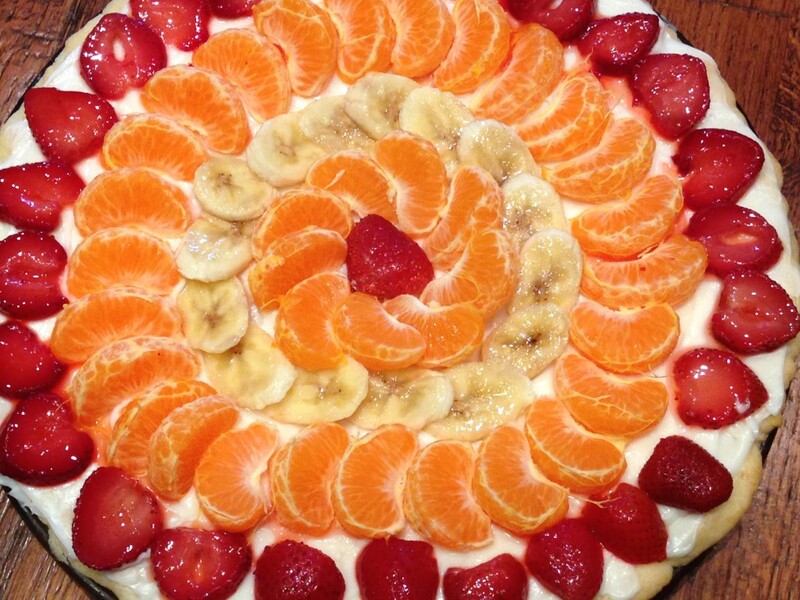 This Fruit Pizza recipe comes from my mother-in-law, Paula, who has made it countless times for birthdays, get togethers, lakehouse trips, and just because! For my 22nd birthday, the first one I celebrated as married, Paula brought over this fruit pizza, and I just fell in love with it. She knew I LOVED fruit, and was right in thinking that I would adore this birthday treat. 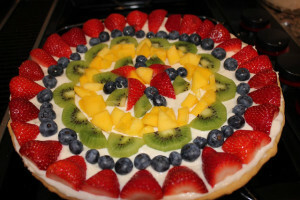 Fruit Pizza is a “healthier” dessert, perfect for the summertime when you are craving something light and luscious. As many of you know, this has been the hottest summer on record for Dallas, Texas (except for the summer of 1980). We’ve already had 14 days of three-digit temperature days and it’s only the beginning of July! Sometimes I notice that the extreme heat makes me less hungry, however, that’s not to say I don’t crave sweets still! As I told you before, the weekends are my husband and my “cheat” days. We eat whatever we want and then start back to our “normal”, eating-right diet on Monday. So today, instead of making a heavy dessert such a brownies or cake, I thought this fruit pizza would be refreshing, sweet, and satisfying. It sure was! Send me pictures of your fruit pizza….you can decorate it with any fruit in this world and in any pattern! Enjoy the aesthetic beauty as well as taste in this dessert pizza! Bake the crust for 15 minutes in a 350 degree oven. While the crust cools, wash and prepare your fruit. Or go to the store to buy cream cheese like I had to! 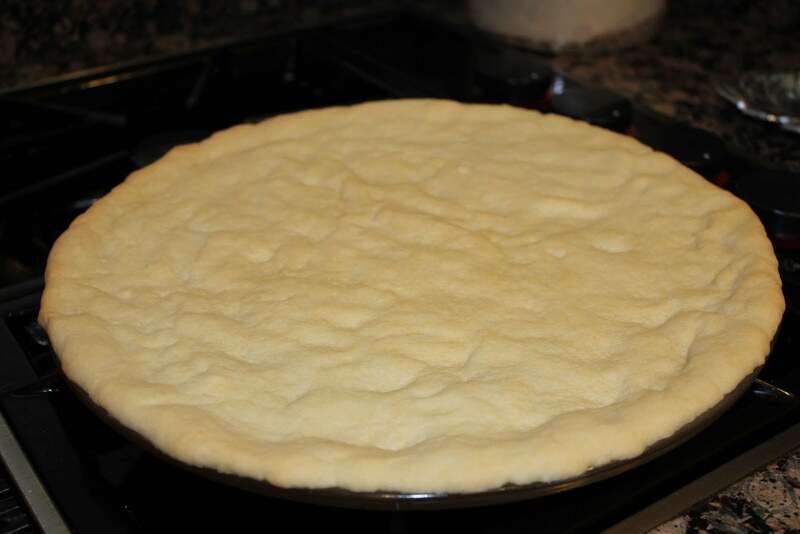 Make your cream cheese filling and spread it on the cooled crust. 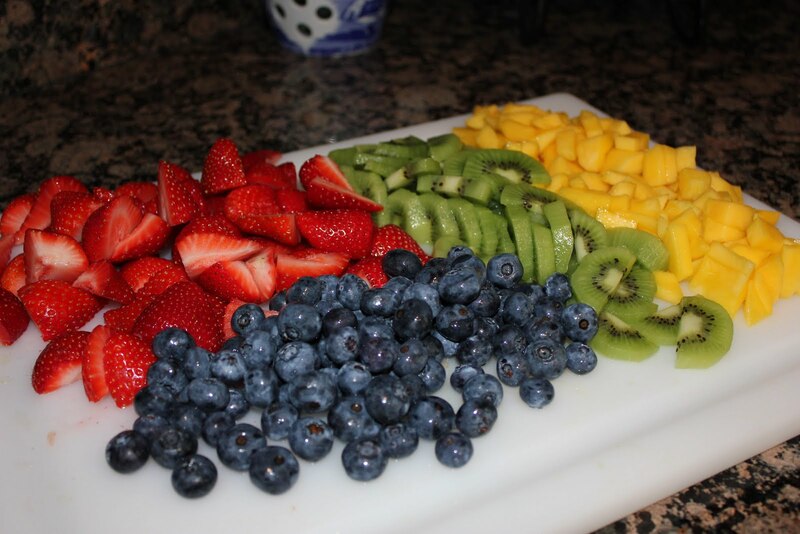 Layer with fresh fruit in any sort of pattern. Feel free to change up your design with different fruits. 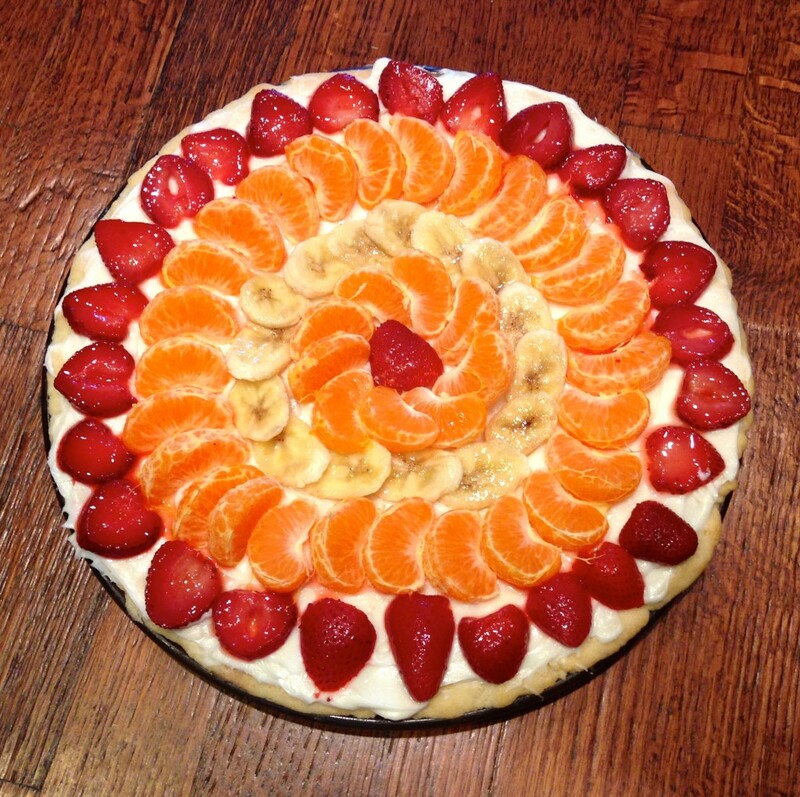 Below I used just strawberries, clementines, and bananas. This design is prettier than the one above. Have fun with it and enjoy! FOR THE CRUST: In an electric mixer, beat the butter, shortening, sugar, and egg on medium speed. Sift the flour, soda, and cream of tarter and than add to butter mixture. Beat until just combined. Press into a greased, round pizza pan. Bake for 15 minutes at 350 degrees. Let cool completely. 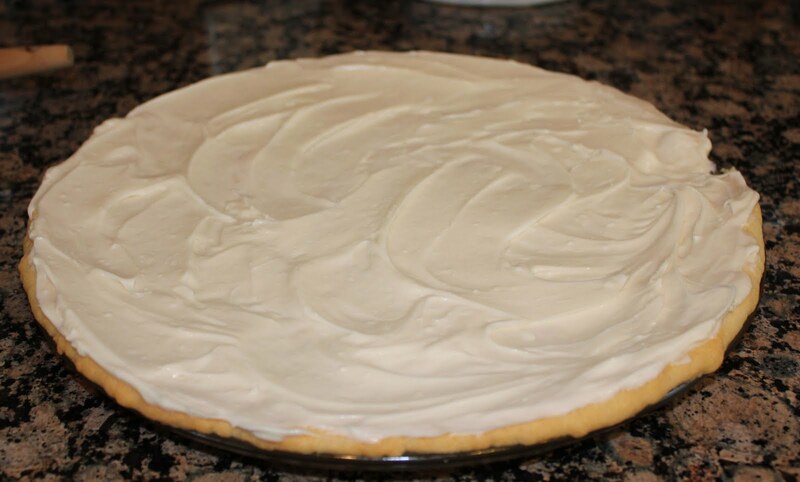 FOR THE TOPPING: In an electric mixer, beat together the cream cheese, sugar and vanilla. Frost onto cooled crust. Arrange fresh fruit in any pattern on cream cheese. If desired, pour strawberry or a peach glaze over fruit. 3 Responses to "Fruit Pizza"
Fruit pizza sounds good right about now!